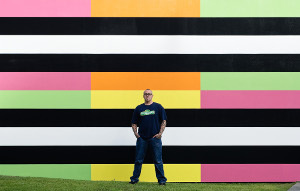 Wayne Youle (Ngāpuhi, Ngāti Whakaeke, Pakeha) was the first artist hosted by the Porirua Community Arts Council Artist-in Residence scheme at Festival of the Elements, Waitangi Day 2014. Wayne ran a one-day visual arts workshop at Pataka Art+Museum for adults, with the theme of “Creating Urban Legends”. To recapture the magical essence of childhood and traditional storytelling, Wayne built a faux campfire and protective “fort”, and participants were encouraged to share stories – new and old, fact or fiction. These tales were then illustrated on walls using locally-fired charcoal. Wayne has strong links to Porirua, so it was great to welcome Wayne back to Festival of the Elements 2014. He has been a presence at successive festivals through his vibrant banners which have told Porirua's oldest story, about the taniwha Te Awarua o Porirua, since he made them for the 2000 festival. Watch this page for details of the next Porirua Community Arts Council Artist-in-Residence.